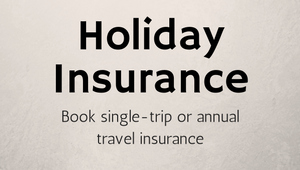 Tempted by the rolling green hills and rugged sea cliffs dotted around the shoreline of the Emerald Isle? Here's our guide to the coolest hotels to stay. Set on an 842 acre estate complete with medieval ruins, walled gardens and winding woodland paths the hotel has been extensively refurbished, restored and expanded over 21 months. Most notably, the expansion includes a new 42-bedroom wing, a ballroom that can host 350 guests and a redesigned golf course by award-winning designer Tom Fazio that is due to open in the Spring. 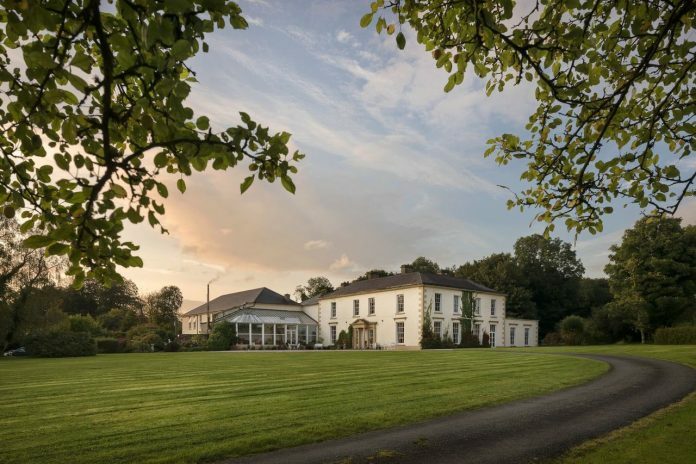 There’s also La Mer spa whose treatments include the 90-minute Miracle Broth Facial but if that’s not your style there are several country pursuits in the grounds from falconry and archery to fishing. 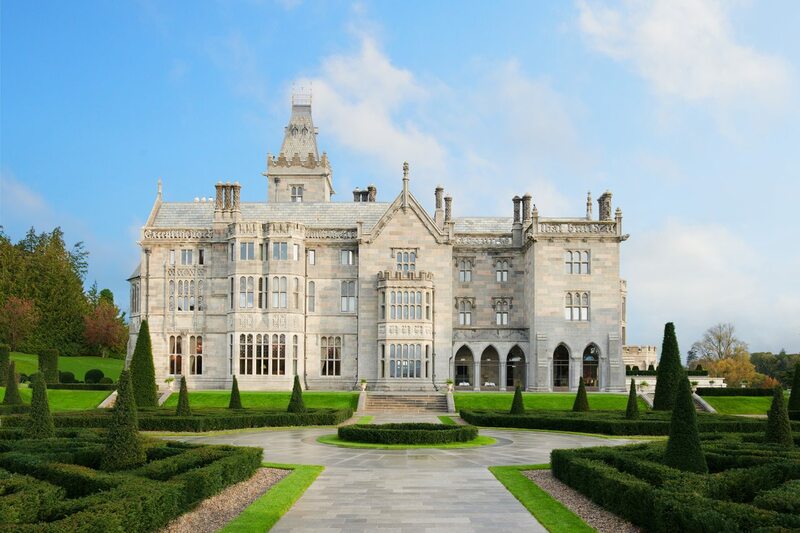 With soaring arched ceilings, stained glass windows and ancient woodcarvings, The Gallery is a magical setting for afternoon tea, indeed Adare Manor even has its own signature blend tea. Meanwhile, the Oak panelled dining room overlooking the River Maigue specialises in seafood and prime Irish meats and, The Tack room is a relaxed space in which to sip cocktails, craft beer and Irish whiskeys. 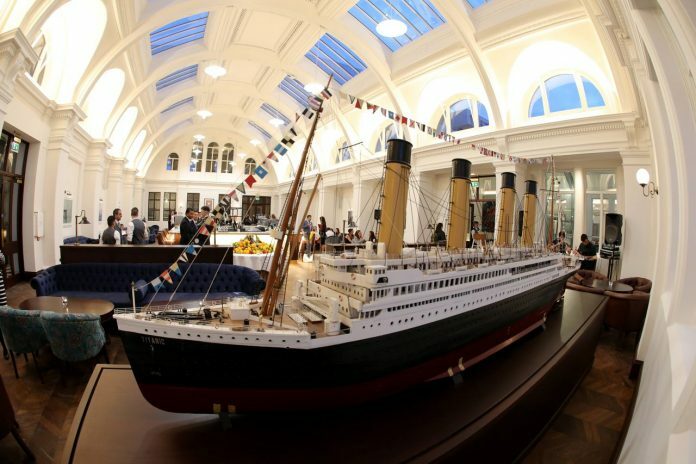 The Harland & Wolff Drawing Offices are where the story of the Titanic and over 1000 other ships truly began. Located in the Titanic Quarter of Queen’s Quay in Belfast alongside the stunning new Titanic Belfast visitor experience, the 19th century building has been transformed into a beautiful 4-star boutique hotel. One of the drawing offices has been turned into a bar and lounge and the bedrooms have a nautical theme. The careful restoration maintains the authentic spaces including the Telephone Exchange which received the first communication of Titanic hitting the iceberg. Nearby is the Belfast visitors and the breathtaking scenery of the wild Causeway Coast. 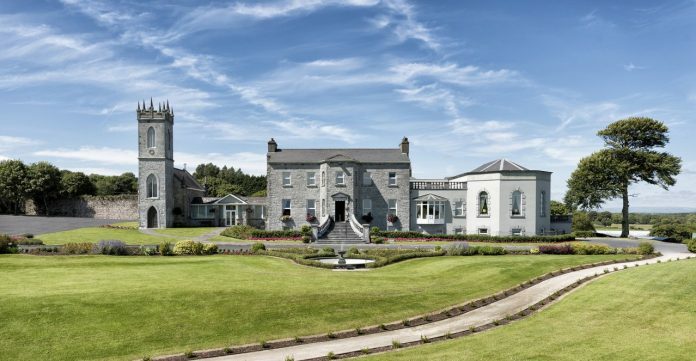 Nestled peacefully on a stunning 138-acre estate on the edge of Lough Corrib, the 5 star Glenlo Abbey Hotel & Golf Resort is a brilliant base from which to explore Galway. 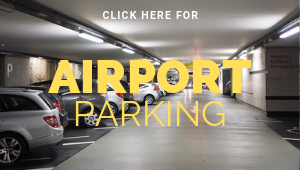 The beautiful, rugged and unspoilt natural scenery of Connemara lies right on its doorstep and creates a soft and balanced contrast to the vibrant and eclectic surroundings of life in Galway City. For a particularly memorable dining experience, guests can dine aboard the two AA rosette winning Pullman Restaurant, set on two original Orient Express carriages now situated in the grounds of the hotel. It serves superb Irish cuisine. Castle Grove is a family-run 17th Century Georgian house set on its own 250-acre estate. It’s the perfect base to explore beautiful Donegal and The Wild Atlantic way, a location famed for its role in the Star Wars films including the latest release, Episode VIII. The hotel’s two drawing rooms, library, bar and bedrooms are luxuriously furnished with antiques, and the restaurant has award-winning fine dining cuisine created using organically grown fruit and vegetables from the walled garden. The extensive gardens were designed by Lancelot “Capability” Brown, the same gardener that designed for Hampton Court and Highclere Castle. Situated on the Grand Canal in Kildare, just a thirty minute drive from Dublin, Cliff at Lyons is a collection of historic rose-clad buildings. They comprise a barracks, forge, manor house with stables and old mill, which have all been lovingly restored into a luxury boutique hotel. Accommodation comprises 39 individually designed bedrooms occupy the old Manor, Mayors building and stables, standalone cottages or apartments. 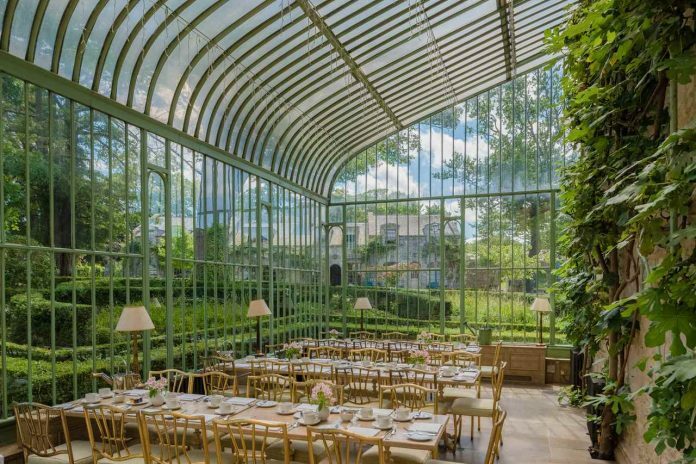 With head chef Nathan Dimond at the helm, the focus is on foraged ingredients such as wild crab apples, damson plums, fungi and elderberries, the beautiful glass-walled restaurant, The Orangery serves a botanically themed menu. Meanwhile the Sunday roast is hosted at The Old Mill, and Trellis serves more informal dining options. In addition to foraged ingredients, Dimond sources locally, with lobster from Carlingford Loch, Galway oysters and outdoor-reared Tipperary pork. Alongside a fantastic food offering, wellness is a key focus of Cliff at Lyons. The Well in the Garden spa is located in the beautifully restored Carriage House and is complete with three treatment rooms, a manicure/pedicure suite and large relaxation space. A selection of nourishing treatments are paired with organic juices and smoothies to ensure a truly revitalising stay.